On Portland’s streets, police say, James and Michael Johnson are known as the “Twin Towers” because the brawny brothers are always together and the sight of them strikes terror among the homeless. Police said they have linked the 32-year-old twins to five unprovoked assaults against transients, all at Colonel Summers Park in Southeast Portland, where they’ve become known for their bullying and beatings. One man sleeping on a bench near the park’s gazebo was pounded with his own bicycle, police said. Another homeless man who yelled at the Johnson twins to stop the bicycle clubbing was then stabbed in the leg, police said. One of the brothers last month threw a woman in her 50s down a flight of stairs at the park after she started to question why the pair kept hurting the homeless. A witness who tried to intervene was then assaulted. 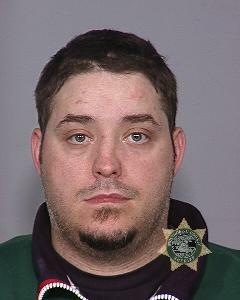 A Multnomah County grand jury has indicted the Johnsons on second-degree and third-degree assault charges. Since their arrests Nov. 16, they’ve each pleaded not guilty to the charges. Since the brothers were taken into custody, other victims have come forward, encouraged by the knowledge their attackers are locked up, police said. Detectives continue to reach out to the homeless at local shelters and church kitchens to determine whether others have been assaulted. Marc Jolin, executive director of JOIN, a nonprofit agency that works to help the homeless into housing, said he learned about some of the beatings from staffers. In fact, many of those assaulted by the Johnsons never called police, but were found by officers some time after the attacks. Court records show a lengthy criminal history for the brothers, dating to when they were juveniles, and prior alcohol, anger management and domestic violence problems. They haven’t had a steady address and have been described as transient at times. They have bounced among friends, listing addresses in Portland, St. Helens and Gresham over the past several years. According to police reports, shortly after midnight July 19, a man sleeping on a bench near the gazebo in Colonel Summers Park awakened to one of the brothers pounding him with his bicycle. The homeless man, Jeffrey Paul Mason, 55, suffered a bloody nose and lost consciousness. When a fellow transient, Charles Vaughn, 42, tried to come to Mason’s aid, one of the brothers turned on Vaughn and stabbed him in the leg, according to police reports. Vaughn told police he limped off and watched the man who stabbed him return and continue beating Mason. Vaughn tied something around his leg to stanch the bleeding. When the bleeding didn’t stop after an hour, he went to a phone booth at Southeast 11th Avenue and Harrison Street to call an ambulance. 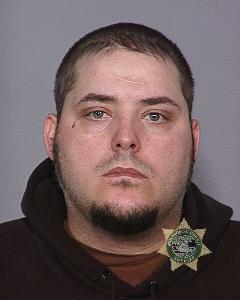 Vaughn suffered a 2-inch gash on his right thigh and was treated at OHSU Hospital. Vaughn told officers he usually spends his nights at the park and has seen the twin brothers assault others. “I can spot those guys from across the park,” he told detectives. By August, detectives distributed a wanted flier to all Portland police precincts, seeking the arrest of the Johnson brothers. Months passed. It wasn’t until Nov. 16 that patrol officers found the twins at Colonel Summers Park, arrested them and took them into custody on warrants stemming from the July beating and stabbing. By then, investigators said, the twins had struck again. In fact, a day earlier, police learned, the Johnsons had attacked a homeless woman who stood up for herself and others at the park. Witnesses told police the twins threw her down a steep staircase on the north edge of the park at Southeast 18th Avenue, off Belmont Street. She was found near the park’s gazebo the next day by police making routine checks. The officers found she had a warrant on a minor park violation. They drove her to jail but soon realized she had suffered a recent injury and called an ambulance to take her to a hospital. 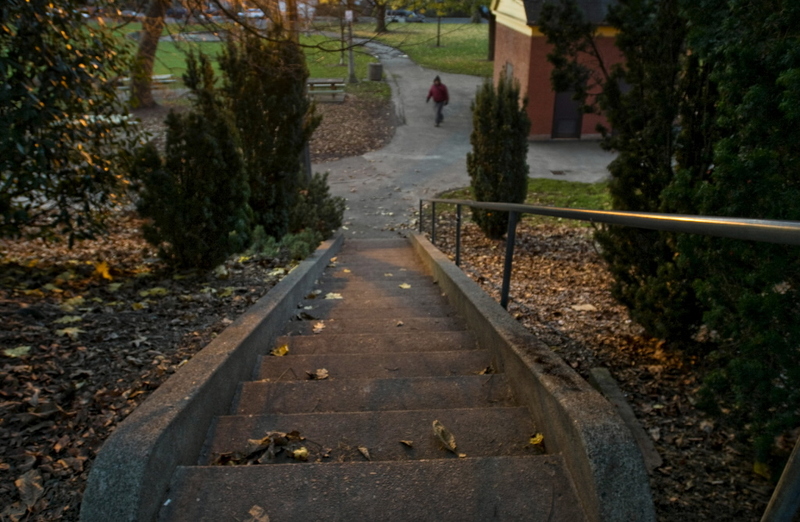 Portland detectives say a transient woman in her 50s was pushed down this staircase leading to Colonel Summers Park, off Southeast 18th Avenue, in mid-November after she stood up to two men. James and Michael Johnson have been arrested on assault charges related to attacking homeless people at the park. The woman sustained a serious head injury, including bleeding in her brain, and was in the intensive care unit at OHSU Hospital for about 10 days, Warren said. “She’s fortunate to be alive,” Warren said. Another man who witnessed the woman’s assault tried to intervene, police said. That’s when at least one of the brothers turned on him. The man suffered facial fractures, a broken left wrist and a cut to his forehead. A 35-year-old man who lives on the streets and identified himself only as Jack said he’s seen the Johnson brothers in the city for several years. He described James Johnson as the more violent of the two. His brother, Michael, whom friends described as a few minutes older than James, always seemed to come to his aid. “One starts it, and the other one backs him up,” Jack said. The twins are each described as 5 feet 7 and 215 pounds, according to jail records. James Lee Johnson has faced serious charges in the past, including a 1995 weapons conviction, a 1998 restraining order in an alcohol-induced domestic violence assault, and a 2004 harassment conviction after police say he spit on an officer. In 2004, court records show, James Johnson was ordered to complete counseling for domestic violence and anger management. I’m disappointed that a website about mental health would not do further research into this incident. You can’t believe everything you read, in fact Michael’s charges were dropped after a citizen came forward and exonerated him. If this woman who had written this article had taken a moment and done her research she would have known that James suffers from Mental illness. This is a mental illness website, is that why you’re posting this article about them on here? You portray them is such a negative light. Did you know their mother lived homeless on the streets and that they were friends with lots of homeless people? Did you know that both James and Mike spent lots of time and money taking care of their friends who were homeless? I bet you didn’t because all you heard was the one sided statements of the police who wanted to paint them in a negative light. For the record James DID NOT throw or push or do anything to any homeless woman. He has a very troubled married life, his wife spent a lot of time in active addiction and still is, if he stood in the way of her drugs, she made up lies to get him in trouble. He suffers too. Get the facts before you paint people to be evil or horrible or make them look like they’re just doing things for no reason. He’s serving a sentence for crimes that he didn’t even come close to committing. The article you’re commenting on was written and published by The Oregonian and informed by police reports. They were tried in court and found guilty of a terrible crime against a fragile person. Your comment, without considerable evidence on behalf of the Johnsons, is foolish. I find it foolish that you believe everything that you read. If you had actually read the Oregonian, you would know that Michael Johnson was let go. He is not in Prison. Yes James is in Prison, but really Publishing an Oregonian article on a website about mental health!?! That I do not get, let vilify someone you don’t know. I would highly suggest that you take down the article in question as it has nothing to do with mental health at all. My statements are based in fact and first hand knowledge of this case, are yours? Did you do any research before you just smeared their names and images all over the internet? I bet you didn’t. I feel sorry for you such hatred must be a burden.